This Monday, Meet The Press and This Week. 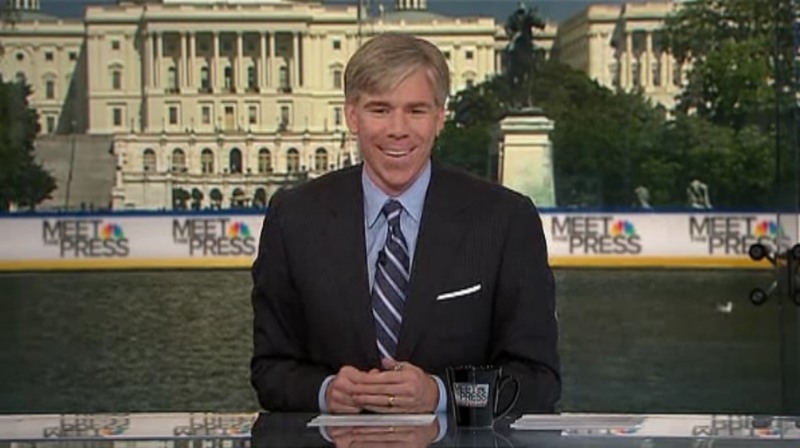 On Meet The Press, host David Gregory was proud to show off the new set and announce that Meet The Press is now broadcasted in HD (the last renewal happened under host Tim Russert back in 1996). SEC’Y NAPOLITANO: I think it certainly could invite profiling. And, again, you know, as an Arizonan I think this law is the wrong way to go. SEC’Y CLINTON: I don’t think there’s any doubt about that because, clearly, as I understand the way the law is being explained, if you’re a legal resident, you still have to carry papers. Well, how is a law enforcement official supposed to know? SEC’Y CLINTON: Well, let’s see whether it’s viable in the U.K. I don’t know the answer to that. We had, in my lifetime, and certainly long before, viable third party candidates. We’ve had Ross Perot, John Anderson, you know, just within my voting history. I think there’s always room in a democracy for people to bring their views to the forefront. But I think one of the real strengths of our system has been our two-party approach, where each party may frustrate some of its own members because they, they do have a broad cross-section of voters and opinions. But, look, I’m going to be as interested in anybody in seeing what happens in the election in Great Britain. MR. GREGORY: Just 35 days ago, during an interview on Fox News, you were categorical about this. The question was, “Are you willing to pledge right here, right now that you will run in the Republican primary for the U.S. Senate and not run as an independent?” Your response: “I’m running as a Republican.” Did you determine in those 35 days that the Republican Party had rejected you? GOV. CRIST: I think the primary part of the Republican Party. The, primary Republicans, if you will. And what ensued in those 35 days was a lot of listening on my part, David. The next weekend was Easter weekend. My wife, Carol, and I went down to Useppa Island and had the opportunity to start listening to people around the state, whether in southwest Florida or in Miami or Jacksonville or my home of St. Petersburg, or in the Panhandle where I am today. And the consistent message that I got over and over and over again was that people were frustrated, they were tired of the gridlock, tired of the bickering in Washington, D.C., and that we needed a new way, a better path, if you will, and encouraged me to run independent and get to that November ballot so that the people of Florida, all the people of Florida, would have a much truer choice when it came to this race for the U.S. Senate. MR. GREGORY: But, Governor, you were elected as a Republican. The Republicans of Florida know you best. And here is your standing in the polls, you’re now some 20 points behind Marco Rubio. What a change from back in October, when you had a pretty commanding lead over him. You say listen to the people. Have the people not spoken? GOV. CRIST: …give them a true choice, and that’s why I’m going to November. MR. GREGORY: I was struck in an interview on Friday, you made a point by saying you’re not deserting the Republican Party. … If you are elected as a senator, will you caucus in the Senate with Republicans? GOV. CRIST: I’ll caucus with the people of Florida. And, and as I said earlier this week, I’ll caucus with anybody who will help my fellow Floridians. MR. GREGORY: But hold on, Governor. You have to make a choice when you’re in the Senate, Republicans or Democrats. Who do you caucus with? As a matter of business, you’d have to decide. GOV. CRIST: Well, when I’m an independent, I’m going to do what I think is in the best interest of my people, and that’s my decision. And that’s what I’m going to do for Floridians. And that’s what people want. They don’t want you to say, look, you have to either go with Democrats or Republicans. You have to go with your gut and with your heart. That’s what this country needs now more than ever, and that’s why I’m running independent. From an analytical perspective, Charlie Crist used some interesting terms: “Primary Republicans” and “November Republicans.” Now, what did Senator Lamar Alexander (R-TN) say about Crist’s decision to run as an Independent? When he changed his mind, I changed my mind about him. I’m very disappointed by that. I mean, it really undermines the ability of people to participate in our politics. We’ve got a lot of alienated people in America right now. They want a place to have their say. So we say, “Come on in to our primary if you want to put a check and a balance on runaway government.” So he did, and now he says, “I’m not doing so well by the rules, so I’m going to go another direction.” That’s what primaries are for. REP. MIKE PENCE (R-IN): I’m still trying to recover being called a moderate by Governor Richardson. REP. PENCE: You know, I’m a, I’m a conservative. MR. GREGORY: Something tells me he didn’t really mean that. GOV. RICHARDSON: I was trying to be nice to you. REP. PENCE: Yeah, yeah, it was nice. PRES. BARACK OBAMA: Unfortunately, John McCain couldn’t make it. Recently he claimed that he had never identified himself as a maverick. And we all know what happens in Arizona when you don’t have ID. Adios, amigos. REP. PENCE: Well, let’s be clear for a second. This is no laughing matter for the people of Arizona who have been profoundly affected by the fact that there’s nearly a half a million illegal immigrants and a rampant drug trade and human trafficking trade that’s been besetting. Phoenix, Arizona, is, is the kidnapping capital of the United States of America. I don’t know if this law is perfect, but I do know that it is wrong for officials in this government to throw stones at the people of Arizona as they’re trying to reassert the rule of law in the wake of the fact that this administration and this Congress have been systematically cutting funding to border security since the Democrats took control. Instead of joking about the Arizona situation and suing Arizona, the president ought to work with the governor and secure the border. … That’s his job, he’s the commander-in-chief. It’s a federal responsibility. When the border’s secure, then we can deal with the people illegally here and how they become citizens or not. TAPPER: There’s a slogan for you, flip-flops I can believe in. MAHER: I could believe in that one, and I hope he does. To enter Mr. McDonnell’s Capitol building or to enter the House office building where Connie Mack works, you have to show a government-issued ID. I mean, this is synthetic hysteria by a herd of independent minds called our political class right now that has decided to stand up and worry about the Constitution being shredded by measures that have ample history of being sustained against constitutional challenges. When you say, Mr. Will, that if you go to Mr. McDonnell’s building or Congressman Mack’s building, you have to show ID, that is the point. Everyone has to show ID. They do not have guards stand there and say, “Only you that I deem to be reasonably suspect because I think you come from a particular group that may be entering the building to do harm, we’re going to search you.” Everyone is searched. This is not the case in the Arizona law. This is not the case of what’s going on in the raids with Sheriff Arpaio there. And this is not what we’re protesting. If everyone was subjected to that, like the buildings you referred to, there would be no cause for concern. The government intrusion, you know, government power is something that really bothers conservatives, unless it’s directed toward people who aren’t white. You know, I mean, it does seem like there’s some of that going on there. Now, Mr. Maher just said, if I heard him right, that conservatives basically are racists and they like government intrusion only against people who aren’t white. Let me defend myself. … I would never say — and I have never said, because it’s not true — that Republicans, all Republicans are racist. That would be silly and wrong. But nowadays, if you are racist, you’re probably a Republican. … And that is quite different. I hope there’s a flip-flop I can believe in there. Here we are 17 months after someone broke into our house, in effect, and robbed us; and we still haven’t even changed the locks on the doors, and we need to get it done. not yet, but we’re getting there. David, I was born at night but not last night. With all due respect to those arguments, those are red herrings. We understand the complexity of it, that’s why we spent so long at this. Richard and I have spent the last two years basically, 39 months, going through hearings, working at this, listening to people, countless conversations with experts in the field. And there are some disagreements here. Not on “too big to fail.” We’re going to shut that down forever. We want consumers to get some protection. We’d like an early warning system so we don’t end up getting into trouble in the first place. And then making sure that no financial institution’s going to be unregulated in our country. PolitiFact: Was Chris Dodd indeed born at night? Bring it on! First of all, I think this bill in Arizona is an invitation to abuse. You’re going to have the government making decisions on the basis of race. And at what level are they making these decisions? At the cop level, in the worst possible circumstances, when people are angry? It’s an invitation to sort of racial profiling and abuse. So I think it’s terrible. But the worst effect is happening back here because now we have the Democrats promising to have a comprehensive immigration bill before any of the preparatory work has been done, pushing aside a lot of other stuff, like cap and trade and energy. And why are they doing it? For purely political reasons because a lot of Democrats, including Harry Reid who is trying to get re-elected in Nevada, need to really fire up Latino voters to get them to come out to the polls. MR. GREGORY: And, Evan, look at the politics of this, Senator John McCain came out in support of the governor’s bill. This was the same Senator McCain who with Senator Kennedy fought for comprehensive immigration reform. It says something about the political mood and the landscape politically of the country. MR. GREGORY: He’s facing a tough primary fight, I understand. MR. THOMAS: And I’m sympathetic for that, a politician’s got to get re-elected. But this was a guy who really knew how to get to the center and to reach across the aisle, and he came close a few years ago in getting this done. Now here he is pandering like crazy to get himself re-elected and endorsing a bad bill. People who know McCain are disappointed by him. I mean, you understand, he’s a politician, but really. MR. GREGORY: A big question that I’ve been thinking about this week, whether it’s health care and its intervention into the economy, whether it’s economic stimulus or whether it’s financial regulation, it is about this debate between the role of government in society, in the economy, in our lives generally. David Brooks, you have been thinking about this a lot and you wrote this in your column on Friday: “In the first year of the Obama administration, the Democrats, either wittingly or unwittingly, decided to put the big government-versus-small government debate at the center of American life.” How’s that playing out? MR. BROOKS: Not well, I don’t think. I don’t think it’s good for the country. You know, we had a bitterly divisive culture war for a bunch of years, then we had a bitterly divisive debate about Iraq. And I think a lot of people, including President Obama, were hoping we could get to other debates about opportunity, about productivity, about fiscal problems. And those would have been debates, which would have structured some bipartisan cooperation. But for whatever reason, we fall into a big government vs. small government debate. And this is like a social script that puts all the Republicans on the anti-government mode, very polarized; strengthens the libertarian, more polarized part of that party; puts the Democrats on a more “let’s use government to do this and that” mode. And so you get this intense polarization which we’ve seen over the past year. It also tends to help Republicans, by the way. But it’s created, not only an end to the polarization, but it’s magnified it, I think. MR. THOMAS: And Obama, you would think he’d get some points for first he passes health care, looks like he’ll finance–pass financial reform. But he doesn’t. He sort of floats around low in the polls. People are really down on government. To me, it’s a deflection from the real issue, which is how we’re going to pay for government. That’s the big thing looming out there. That’s what we ought to be talking about. And, unfortunately, both sides have got to give on something because we’re going to–you can’t deal with it unless, one, you raise taxes, which people don’t like; and, two, you cut benefits. Both sides got to give. That’s what Obama needs to be talking about because that is the real challenge facing us. MR. BROOKS: Can I just say something about the Republican mounting strategy, which is people like me would like there to be centrist, like Governor Crist, people like that. But the center has so far proved unprincipled, and people like Marco Rubio and Paul Ryan have shown they’re principled. And when you’re disgusted by government, you congregate toward people like that. And so the evidence shows overwhelmingly, so far, that the further right the party gets, as long as they’re principled, the better they do. Has any party had a worse year than the Democrats have had politically this year? Democratic favorability rating has dropped 22 points in a year. The Democrats a year ago had an 11 point party idea advantage over the Republicans. All that’s gone. So the Republicans are surging at the point they’re moving to the right with people like Rubio. And so that’s where the data is. People like me would wish, you know, go for the middle. But the data supports the idea that people like Rubio are driving the party to victory. Well, OK, but if your desire is for the center, where, to come back to your original point, is there a more centrist big government argument to make? In other words, does President Obama have to win the argument that government is actually helpful? MR. BROOKS: Yeah. Well, he won election because he won independents. The tea party movement is like really big and sort of interesting, but the core movement in politics has been in the center. He’s lost independents. And so he has to go being sort of the way he was on Wall Street this week, which is a pragmatic intelligent guy who talks about the things Evan talked about, that we need to have these things on both sides. And if he can embody that, he personally will be able to recapture the suburban voter. Whether the Democratic Party in the House can do it I’m really doubtful. MS. NORRIS: If the party moves, if the Republican Party, though, moves farther to the right, do they capture those voters that are in the middle? MR. BROOKS: Well, I, personally I’m dubious. But I’d love to see some evidence to suggest that the Republicans I sort of like would do well. I don’t see any evidence of that. I see the Rubios doing really well. MR. THOMAS: But can the Rubio people ever get the 51 percent? MR. BROOKS: Right. I, I think the Republicans will do phenomenally well this year. 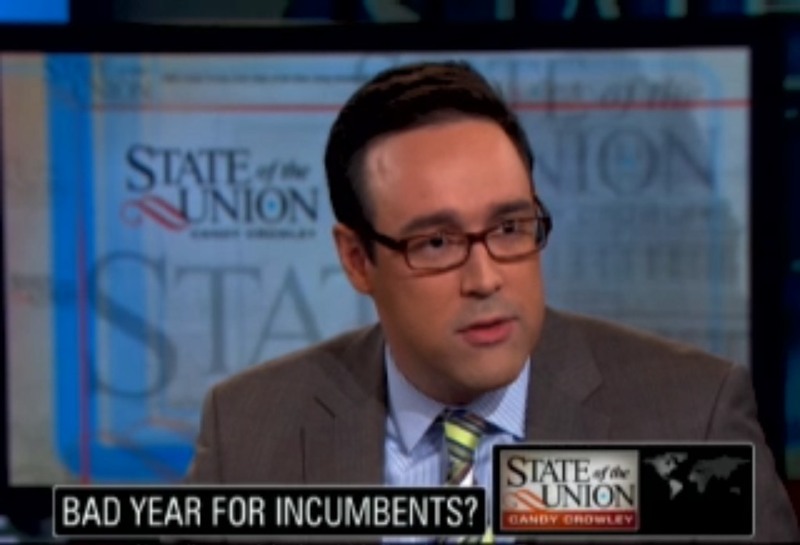 MR. BROOKS: But it would be tough to see a Rubio-type candidate winning in 2012. MR. BROOKS: But remember, the politics of the country are unprecedented, the disgust is amazing, and so I think we’d be hesitant to predict something like that. No [it will not end too-big-to-fail], because that’s not the problem. We all sort of sympathize with Sherrod Brown and Senator Kaufman’s idea that if it’s too big to fail, it’s too big to exist. The problem is it’s not scale, it’s connectedness that poses so-called system risk. And what people are arguing about is whether or not they have accurately located risk to the entire system. This is an unusual argument. Usually in Washington when there’s controversy about a bill, the two sides agree about what the bill does but not whether it ought to be done. In this case, there’s an argument about whether or not the bill will actually do what it sets out to do. Both sides want to guarantee the obliteration of certain kinds of failed firms. They want the management to go and they want shareholder equity to disappear. So it’s a competition to see who can be most beastly to these bad companies. And the question is whether or not this happens. TAPPER: The Center for Responsive Politics did a study of campaign contributions, and in this cycle, the finance, insurance and real estate sectors are giving much more to Democrats than to Republicans. $65 million to $51 million. Paul, do you think the Democratic Party is too close to Wall Street? 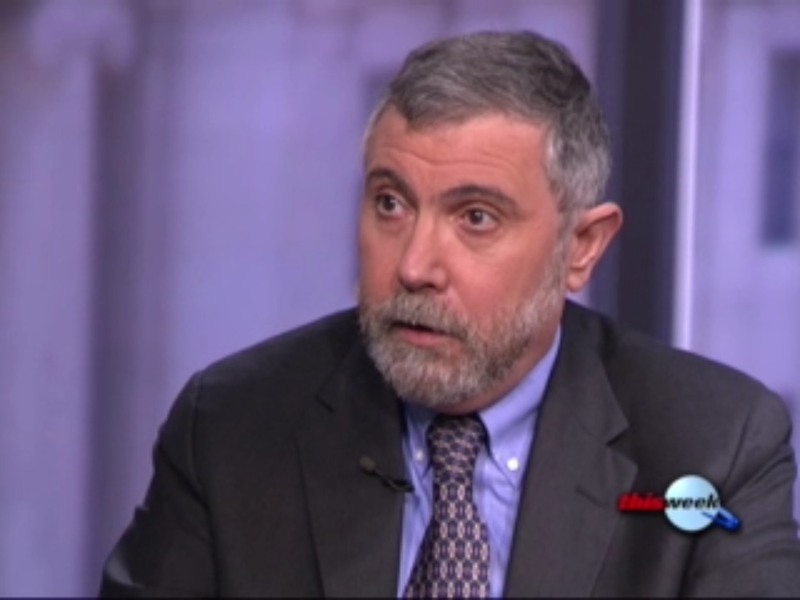 KRUGMAN: Well, it has been in the past for sure. No question that in the late ’90s, the Clinton team — some of whom are now in the administration — were way too close to Wall Street. They believed that these were wise men who knew what they were doing. And no, at this point, it’s the party in power, of course, is going to be getting a lot more contributions. It’s kind of — that’s not too surprising. Let me say a couple of things here. Anyone who says we need to be bipartisan should bear in mind that for the last several weeks, Mitch McConnell, the Senate minority leader, has been trying to stop reform with possibly the most dishonest argument ever made in the history of politics, which is the claim that having regulation of the banks is actually bailing out the banks. And basically, the argument boils down to saying that what we really need to do to deal with fires is abolish the fire department. Because then people will know that they can’t let their buildings burn in the first place, right? It’s incredible. So anyone who says bipartisan, should say, you know, bipartisan doesn’t include the Senate minority leader. But, you know, I agree with George, actually, believe it or not. Too big to fail per se is not the problem. The Great Depression was made possible by the failure of the Bank of the United States, which despite its name, was a Bronx-based institution that was the 28th largest financial institution in the United States at the time, and yet brought the whole system down. But what we are getting now in this bill is a way to have graceful failure of big institutions, right? We know how to deal with small banks. The FDIC seized seven banks last week that were on the verge of failing and let them, you know, liquidated them gracefully, but we don’t have a way of dealing with complex, you know, what we call shadow banking institutions like Lehman or Citigroup. And this bill would give you that. So it would give you the ability to do for big, complicated financial institutions what we’ve been doing routinely for small ones, and that does — so it doesn’t end the too big, but it may deal with the fail bit. We have never put in enough money is basically what it comes down to enforce the border control. It’s not a deep issue of principle, it’s just a question of resources. People have been willing to talk tough about it but actually not willing to do reasonable stuff in terms of enforcement. And it’s going to be a problem. But what I want to go back to here is not just apartheid issues, but think about a different way. We have these massive protests in this country about alleged authoritarian tendencies that we are going to have some kind of — inside the Obama/Hitler stuff — the idea that the government is encroaching too much in our lives. And now all of the sudden, we have by pretty much the same people, demanding that we set up a system that will turn us into one of those apocryphal foreign authoritarian regimes where the police are saying hand over your papers, right? A world where you constantly have to prove who you are. And yes, it will be racial profiling but who knows what else? I mean, some people take me I look like President Lula of Brazil, so I might end up being pulled over when I’m on my morning walk, right? What the Arizona law does is make a state crime out of something that already is a crime, a federal crime. Now, the Arizona police — and I’ve spent time with the Phoenix Police Department — these are not bad people. These are professionals who are used to making the kind of difficult judgments. Suspicion of intoxicated driving, all kinds of judgments are constantly made by policemen. And I wouldn’t despair altogether their ability to do this in a professional way. Let me say this about immigration reform, though. If we thought health care reform was divisive, this is going to be an all-out battle, and will even create fissures in the Democratic Party. That’s why Speaker Pelosi has said we will act, but only if the Senate acts first. President Obama has been saying — pointing out that there were 11 Republican senators who supported immigration reform in 2007 when it failed, and suggesting that they need to support it now. I don’t think they’re going to support it, though. Well, politically, though, this is one of those issues that cuts right through the middle of both parties. The Democrats, on the one hand, tend to be pro-labor, which means they are worried about immigration; on the other hand, it is the party that now gets most of the Hispanic votes, it’s the party that generally is for inclusiveness. So the Democrats are divided. Many of them divided within their own hearts. It’s an interesting thing, it’s not so much different wings of the party as each individual Democrat tends to be kind of torn about this. Republicans are divided between the sort of cultural conservative wing, the preserve America as the way it is, and the business wing, which likes having inexpensive immigrant labor. So this is one heck of an issue. It’s deeply divisive among both parties, which is one reason not to rush it, to push it at the top of the agenda right now. Mitch McConnell, the Senate minority leader, has been trying to stop reform with possibly the most dishonest argument ever made in the history of politics, which is the claim that having regulation of the banks is actually bailing out the banks.